A bus operator in WA is petitioning for compulsory seatbelts in all buses which carry school children – not just morning and afternoon services. Dingo Bus Charter Director Andrew Reid started the petition last week in hope of making it compulsory for all school buses to have seatbelts. 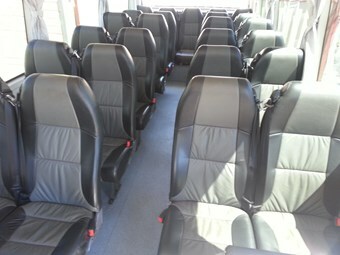 Although the orange school buses are fitted with seatbelts, schools can chose to hire any bus or coach for excursions – with or without seatbelts. Reid says the law change will probably never happen, but: "If I can get all students transported to and from school and all excursions on buses with seatbelts, I’ll be happy. "The moment we drop them off at school we’re saying ‘it doesn’t matter what happens to them after that." He says schools are able to pick their own operators for excursions and safety does not seem to be a priority. "It’s up to the school but a lot of schools will contract buses on price – not safety." Reid, who has about 35 years’ experience driving school buses, says safety is his main priority and his company has spent about $1 million on new buses in the last month to ensure a high safety standard. "Now I’m going to have to convince the schools that the little bit of extra cost they spend to hire me will provide the safest service." Reid says bus crashes are "few and far between" but says it is better to be safe, than sorry. The Midvale-based company has eight private school runs and each vehicle is fitted with seatbelts.